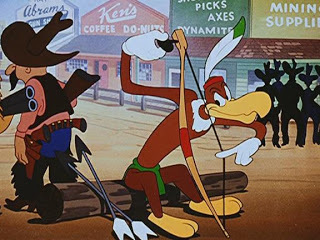 In ‘Sling Shot’ Woody Woodpecker enters a shooting contest in a Western town. Woody wins time after time using his slingshot. His main rival is Buzz Buzzard, who ‘plays’ an evil, but extraordinarily dumb Indian who fails to understand the slingshot’s mechanism. When Buzz steals the prize money, Woody destroys the villain with an H-bomb, a nuclear weapon that would be tested the following year. Despite the animation being surprisingly good at times, ‘Sling Shot’ is a rather mediocre cartoon, but it is noteworthy for being the first Woody Woodpecker short to feature both Buzz Buzzard and Wally Walrus, who appears as a sheriff.